Coins have a unique significance in the history of Aksum. They are particularly important because they provide evidence of Aksum and its rulers. The inscriptions on the coins highlight the fact that Aksumites were a literate people with knowledge of both Ethiopic and Greek languages. It is generally thought that the first Aksumite coins were intended for international trade. These coins, bearing the name of King Endybis (c. 270/290 C.E. ), were mainly struck in gold and silver and followed the weight standard which existed in the Roman Empire. Initially, the symbols of the crescent and disc, which were common to the religions in South Arabia to which Aksum adhered, were used on early Aksumite coins. But after the conversion of King Ezana around 340–356 C.E., the king made a powerful statement by replacing the existing symbols with a cross which clearly denoted the importance that Christianity now had in the kingdom. The coins also had a portrait of the ruler on the obverse and reverse of the coin along with teff, a local type of wheat. Inscriptions were another form of information included on the coins. Gold coin, c. 270-300 C.E., gold, Aksumite, modern Ethiopia © Trustees of the British Museum. Obverse showing head and shoulders bust of King Endubis facing right, wearing headcloth with rays at forehead and triangular ribbon behind, framed by two wheat-stalks. Disc and crescent at top. For the most part, gold coins were inscribed in Greek and often intended for exports, while silver and copper coins were insribed in Ge’ez (Aksumite script). From the 4th century C.E., an increasing number of copper coins were issued which had evidently Christian inscriptions such as “Joy and Peace to the People” and “He conquers through Christ.” With the replacement of gold coins with copper ones, the craftsmen of Aksum started using specialized techniques of gilding, which was unique to the kingdom and involved gold leaf being added to crowns and other symbols to enhance the appearance, and most probably the value, of coins. This coin was minted during the reign of King Joel in sixth-century Aksum. Between the second and the ninth centuries, the kingdom of Aksum prospered in Ethiopia. The trade routes along the Nile Valley that led to the Red Sea and on into the Indian Ocean made Aksum a destination for many merchants and travelers. The large cross on the reverse of the coin symbolizes the country’s shift to Christianity. This took place during the fourth century when a traveller named Frumentius converted Aksum’s ruler, King Ezana. The old religious symbols of the sun and the moon no longer appeared on coins and were replaced with a cross, which was enlarged over the years. 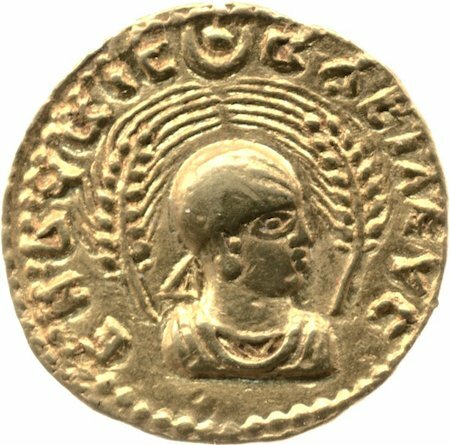 The religious symbolism on these coins had strong political implications, as it aligned Aksum’s religious identity with its main trading partners, Rome, and later Byzantium. J. Williams (ed. ), Money: a history (London, The British Museum Press, 1997). Cite this page as: The British Museum, "Aksumite Coins," in Smarthistory, September 23, 2016, accessed April 20, 2019, https://smarthistory.org/aksumite-coins/.